About five centuries ago, a mysterious group of indigenous people came to an unknown island and were left behind the all gold ornaments in Inca Empire. There was a lot of wealth that an Egyptian Pharaoh has not seen in his lifetime. But in time, all ornaments went behind the scenes. Dark Peat found a clue of that secret treasure when he came to rescue a group of Peruvian scientists. From the Andes Mountains to Mexican Dead Sea, the work was started of Billion dollar worth wealth. Dark took with him childhood daring friend Al Giordano and beautiful lady Shyanan. Finally, who got the lost treasure of the ancient Inca Empire? Read the book and know that. **Readers can also collect an another mysterious book of this author's- 'Sahara by Clive' from this blog. 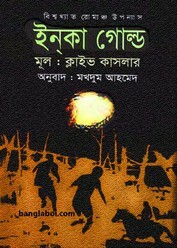 Now collect the Bangla translated book- 'Inca Gold' in pdf file.